Photo essayist Ancona introduces readers to the joys of dance through the eyes of four grade schoolers: Raptor, Ely, Logan, and Ryan. Through the work of the National Dance Institute of New Mexico, the boys and their classmates are introduced to various styles of performance, including ballet, tap, and even stage combat. Dance requires a great deal of strength and energy, to run, leap, and lift their partners in the pas de deux. This artistic athleticism is perfectly suited to these exuberant boys. Many weeks of rehearsal culminate in a live performance involving hundreds of other schoolchildren and community members dancing pieces inspired by various works of literature. Though the boys (two kids of color and two who present as white) are the featured characters, the ensembles are clearly coeducational and racially diverse. 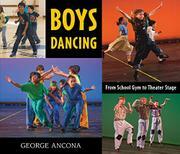 Ancona highlights many stereotypically masculine aspects of dance (stage fighting; lifts and flips) that young people may be unaware of, likely hoping to appeal to other young men who might harbor the misconception of dance as an exclusively feminine performance art. The simple text is choppy at times; here the photographs fill in many of the missing details, though younger readers may need help to make these leaps of inference.